Trec Carbo Full Gel is a convenient energy gel that supplements easy carbohydrates along with mineral components. The additional content of taurine supports the functioning of skeletal muscles, and glycine contained in the supplement helps maintain positive mood and control body weight. The product is perfect for long-distance runners, cyclists or people participating in obstacle races. The product contains as many as three sources of carbohydrates - maltodextrin, dextrose and isomaltutose. This combination ensures different kinetics of sugar absorption, which allows immediate energy delivery and its continuous supply for a longer period of time. Despite having a complex structure, the carbohydrates contained in the preparation are characterized by a high glycaemic index. In addition, they are easily absorbed from the gastrointestinal tract and do not cause digestive discomfort. Carbohydrates are the basic energy source for skeletal muscles during physical activity, and their increased supply can effectively delay fatigue and help keep up high intensity of work. Carbohydrate intake is especially important during long and exhausting efforts, when huge amounts of energy are needed. L-Glycine - an endogenous amino acid that participates in the conversion of glucose into energy. It is also involved in the production of haemoglobin - the blood red dye responsible for oxygen transport. This amino acid has antioxidant properties, helping to get rid of free oxygen radicals formed during physical activity. Its action within the nervous system allows you to reduce fatigue and ensures the efficiency of the nervous system. Taurine - an amino acid with anti-catabolic properties, involved in maintaining proper muscle contractility and efficiency of impulse transmission in the nervous system. This amino acid promotes the maintenance of proper fluid balance in cells, and is involved in the transport of creatine to skeletal muscles. Taking taurine may delay the onset of fatigue and also reduce the number of inflammatory states in the body that result from exhausting efforts. Calcium - the key element maintaining correct bone density. It determines the proper transmission of impulses in the nervous system and is involved in skeletal muscle contraction. It is an activator of many enzymes in the body, including those releasing energy from adenosine triphosphate (ATP), which is the basic energy carrier. Magnesium - it takes part in more than 300 biochemical reactions (including ATP synthesis). It is necessary for proper muscle contraction and conduction of nerve impulses and contributes to increasing bone density. In addition, magnesium improves the exercise capacity of the body, increases muscle oxygenation and promotes the maintenance of normal work of the heart muscle. Potassium - an element found mainly inside the cells, providing them with adequate nutrition and supply of nutrients. As the main cation of the intracellular environment, it participates in the regulation of arterial pressure as well as maintaining normal cell function. Sodium - an element occurring in a high concentration outside the cells, which is excreted with sweat in large quantities. Its deficiency can lead to hyponatraemia, which results in impaired transmission of impulses in the nervous system, and in the case of very severe deficiencies may even be life-threatening. Sodium and potassium are formed by the Na + / K + ATP protein enzyme, known as the sodium-potassium pump, whose functioning ensures the proper course of processes in cells. Chloride - contributes to the maintenance of proper water and electrolyte management as well as the optimal pH level of cells. The element is eliminated from the body along with sweat, and its deficiency can lead to muscle weakness and the occurrence of involuntary muscle contractions. 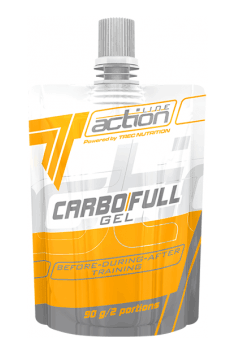 To sum up, Trec Carbo Full Gel provides quickly assimilated energy in a convenient form. High energy gel, enriched with essential elements and amino acids necessary for proper functioning, improves the exercise capacity of the body. The gel was composed of sugars with different absorption kinetics, which ensure continuous supply of glucose to the muscles, while not burdening the digestive tract. Water, Maltodextrin, Dextrose, Izomaltulose, Thickeners (Guar gum, Xanthan gum), Acidity regulator (Citric acid), Flavors, Coloring agent (E110), Preservatives (Potassium sorbate, Sodium benzoate), Sweetener (Sucralose).